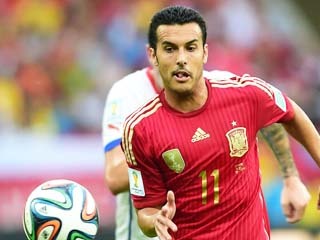 London, July 23: Chelsea announced on Sunday that Spain forward Pedro Rodriguez is to return to London for further review after he suffered a concussion in a friendly match against their London football rivals Arsenal in Beijing. The international forward sustained an injury during his side’s 3-0 victory over Arsenal at the Bird’s Nest stadium in Beijing on Saturday and had to be taken to a hospital, reports Efe. “Pedro stayed in hospital overnight in Beijing for observation having sustained a concussion and facial injuries in last night’s game against Arsenal,” Chelsea said in a statement on its official website. Pedro fell awkwardly after colliding with Arsenal goalkeeper David Ospina during the first half of the friendly and had to leave the pitch. “What a shock! Fortunately everything is ok,” Pedro tweeted after he was rushed to hospital. Chelsea’s Italian coach, Antonio Conte, confirmed after the friendly that Pedro would not travel with the team to Singapore, where the Premier League champion will face Bayern Munich on Tuesday in the International Champions Cup. Spanish striker Alvaro Morata, who recently moved from Real Madrid to Chelsea, is set to join the English side in Singapore following Pedro’s abrupt departure.